The news that Pet Airways was open for business may have sent their website crashing today, but there's nothing but successful take-offs and landings scheduled for their fleet of 20 pawsenger-friendly airplanes. Starting July 14, 2009, dogs and cats will ride in first class to and from New York, Washington, DC, Chicago, Denver and Los Angeles. Well, it's first class compared to the cargo compartment. 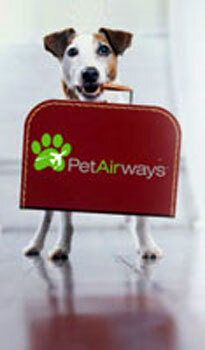 Pets will fly, crated, in the air controlled cabins of the planes. All aboard! Oh, not you. You'll have to find your own flight. No humans allowed, except for the pilot, of course, and some well-chosen pet attendants! But, during your pet's flight, you can check in on him to see how he is doing. your pet could be made to hold themselves for a very very long time. of our pawsengers is our first priority."